Do you do online or offline presentations for your home based business? 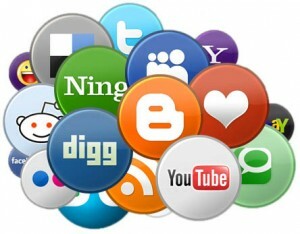 Have you ever done a social media presentation for your network marketing business? Do you do at least 2 presentations a week? 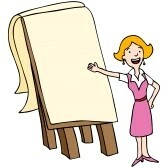 There are many great tips that you can find for great presentation that rock. There are even tips now for MOBILE presentations that can change how you view your smart-phone. And of course, there are secrets that often are not told that can make a good presentation into an EXTRAORDINARY presentation. I have done presentations in over 30 countries and have found that the appeal to the masses is the same now matter what language or culture. A home business is pretty much the same everywhere and the presentation is all a part of that culture. Some people prefer to give online presentations via webinars and online chats like Google hangouts. Other prefer a more “live” version and do it face to face or at least over the mobile phone. No matter what you do, a presentation needs 7 words in it that will ROCK the presentation and make it HOT and impactful. 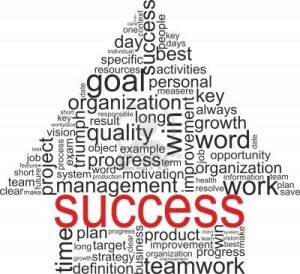 These are 7 words that any presentation should have in your mlm network marketing home business. Have you ever wondered what was the difference between a superstar recruiter and the average in home business? Would you consider yourself a super star recruiter or average in network marketing? 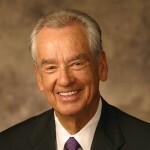 What do you think are the distinctions in the mlm process? There are MANY distinctions in how top recruiters do their job and the average. Today I want to cover 5 things that over the years I have noticed are there. 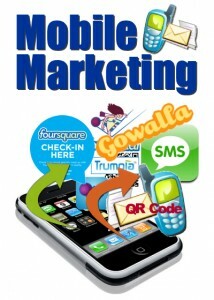 It does not matter if you are recruiting on mobile, local, social, or online marketing. 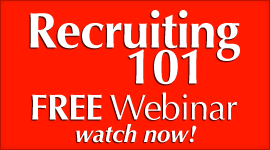 The recruiting strategies and principles are pretty much the same as afar as the approach to recruiting. Many leaders think that their team will do the steps to recruiting and succeed. But there are other elements to recruiting that need to be considered as well. Just as a chef prepares the food a little different then say another chef, the superstar recruiter does the same thing. They have small differences that make a huge difference. The most powerful thing about those that CRUSH the recruiting process is that they see recruiting a little bit different then the average. They see it as something that will drive VALUE into people’s lives and change them. The average seem to see that recruiting is how you build a business that will help them earn money. Nothing wrong with that. 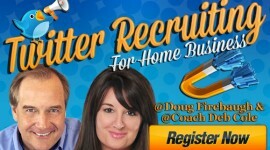 But that is not the focus of recruiting and that is why that superstar recruiters RULE in a home business. What are the 5 key distinctions? 1. Superstar Recruiters practice “VALUE Driven Recruiting.” The Average practice Volume driven Recruiting. Do you see that? Value is the FIRE behind the top recruiter. They want to being a powerful Value to the marketplace and find people that can do the same. They do not recruit- but they DRIVE the life changing Value into the marketplace in multiple ways. 2. Superstar Recruiters spend less time with their prospects. They are too busy talking to a lot of people and they spend almost half the time with the prospect that the average do. Thee average seem to try and convince people their business is for them. the Superstar recruiter does not. They simply talk to people and find out if they are in a place in their life to appreciate the life changing value of their business. 3. Superstar Recruiters qualify the prospect for their time. The average do not. The top recruiters in our profession know the Value of their time as they are Value driven. They will not spend a lot of time talking to unqualified candidates. They will make sure they are who THEY are looking for, and will not go on if the prospect is not. 4. Superstar Recruiters use ALL of the Available Markets for Recruiting as they keep up with the technology and marketplace advances. 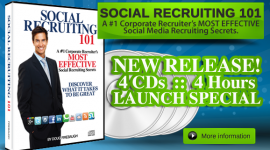 Superstar recruiters recruit using social media, mobile media, and online marketing tools. They are not limited to what others think is the “right way” to do it. The right way to the top recruiters is what works and works huge. 5. Superstar Recruiters Listen almost 4 times more the the average recruiter and ask 3 times as many questions whether online or offline. This is critical. Questions are tools that need to be mastered and the Superstar Recruiters are masters at asking the RIGHT questions to move the prospect forward. These are 5 critical differences between the average and Superstar recruiters in the mlm network marketing home business profession. Do you ever stand in line talking to people about your home business? Do you ever stumble over you own words about your network marketing business? How do you even START an mlm conversation if you are standing in line or on a plane? It is all about how you communicate and ask questions to people. It is how you approach people in the social media space, and mobile space. It is ALL about the communication. And no matter what you have learned about personal development and leadership- if you are not communicating that MOVES PEOPLE– you will not succeed long term. Conversations are critical whether face to face or online. Starting a conversation that is MAGNETIC is even better and we are going to teach you several things that will help you in breaking the ice and starting a conversation with anyone that you want. It ALL STARTS with Opening Conversations with People. people, how do you open up a conversation? When you are standing in a line? There are many different ways, but here are some that have proven to foster Connection as well as Magnetism in talking with people. These are great conversation starters that will work amazingly in your mlm network marketing home business. 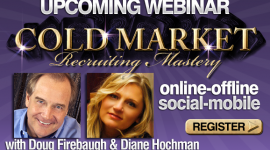 FREE mp3 download – “2013 Recruiting Secrets”- over 25 secrets- with Doug and Diane Hochman! 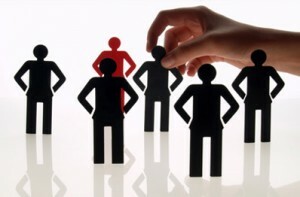 MLM Rules of Recruiting Business Professionals. 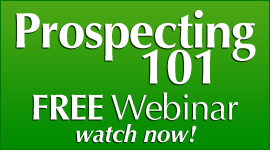 Do you strive to recruit business professionals for your home based business? Are you currently focused on business professionals in your mlm? Do you think for your network marketing business that a small business owner would be good for it? 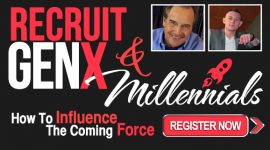 There are different “rules” of recruiting professionals in 2013, and if you know the rules, and recruit within them, you will find that sponsoring business owners is not as hard as one may think. I recently did an article recently the Psychology of Recruiting Business Professionals which will help you understand what and how the business professional thinks. There are certain things that one must adhere to, if you are going to be a powerful recruiter of small business owners. We have found through years of experience that there are 8 rules that we have found true for business professionals and the art of recruiting them. Many distributors and consultants never try and recruit small business professionals because they think they are out of reach. That is not true. But odds are, many of them have been part of a recruiting process that did not go so well, as some of the rules were broken and turned the professional off of network marketing or a home business. This happens all the time unfortunately. I had the great blessing of having thousands of small business owners in our group and they exploded a lot of the business we were able to build during that time We had in one leg over 2500 business owners and that leg was amazing. It was a professional leg that acted, thought, and recruited professional. You can do the same thing if you follow the rules. What ARE those rules? 1) No MLM “ease” or verbiage. Many of the folks in a home business use a language that the professional does not understand. You MUST talk the language that a professional understand. 3) They are looking for RESULTS. 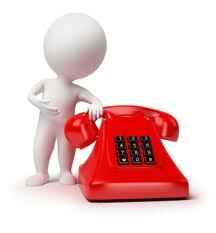 WHY should a business owner be talking with you? How are their RESULTS going to change? Show them how to increase and multiply their results, and you will increase the odds of recruiting them tremendously. 4) They expect it to be ABOUT THEM. Make the conversation about the professional. Ask them the story of their Success. Ask them what struggles they had at the beginning. Ask them anything that will get them talking about themselves. This will endear them to you. Yes, many business professionals have egos. 5) Be Relaxed- NO PRESSURE at all. 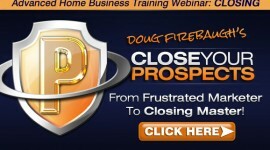 If a small business owner sense that you are pressuring them, they will close down and end of discussion. There is no reason for pressure. Either they see it, or they do not. If they do not NEXT! There will be more than one conversation with a small business professional as that is the normal path they travel in business. Most business dealings are more then one conversation and odds are your recruiting them will be multiple conversations. 7) Focus on their expertise and help. Small business owners has expertise. Ask them to advise you, and see if they can give you some tips on your success. Most professionals will do this. Ask them about marketing and leadership and Success secrets. This will build a powerful bond to you. 8) Talk to the personality. Many business owners are DRIVERS. There are 4 kinds of business personalities: Driver, Feeler, Analyzer, and Socializer. Talk to the personality. Talk to the Driver bottom line, and little details. What will your business do for their business? period. End of discussion. How will your business add to their income. TALK RESULTS with a Driver. Talk making a difference with Feelers. Talk details with Anlayzers. Talk FUN with Socializers. These are 8 Rules that we have found work well in recruiting small business professionals in your mlm network marketing home based business. 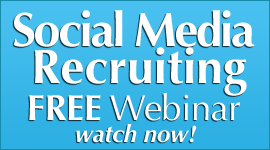 FREE hour long mp3 download: “2013 Recruiting Secrets” with Doug and Diane Hochman-over 25 secrets of recruiting for 2013!